Hello my pumpkins and happy monday!! 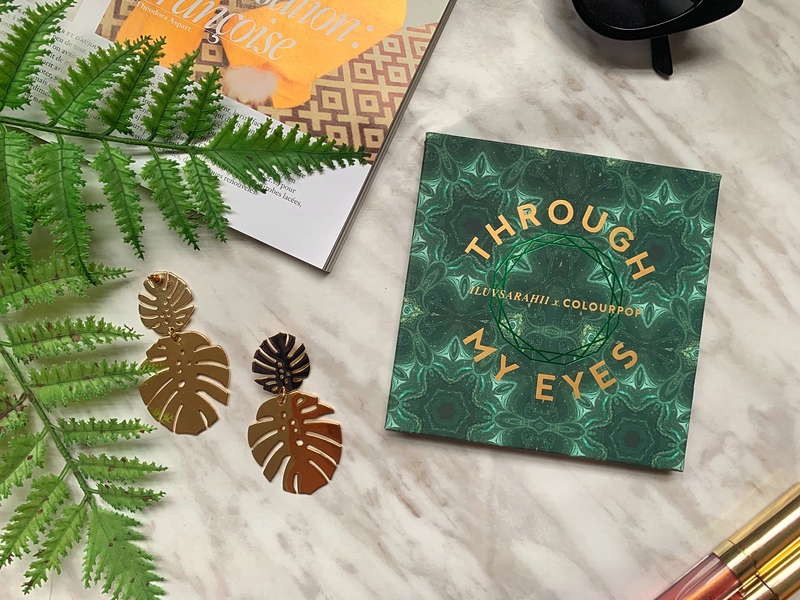 Today, I am going to be sharing with you my review on Colourpop’s Through your Eyes palette, it was in collaboration with Iluvsarahii, a very famous beauty blogger. I really wanted this palette because the shades are so tropical and screams summer to me! Plus, I am hating all new makeup releases, except that beautiful Tarte palette, omg, how gorgeous. I actually haven’t reviewed a colourpop product in a long time so I thought it was about time I did! Anyways, don’t forget to check out my previous post: 60s Inspired Makeup Look and let’s get into it! This palette retails for 23$ and contains 16 eyeshadows, 8 metallics [some of them are more glittery than others] and 8 mattes and a mirror. 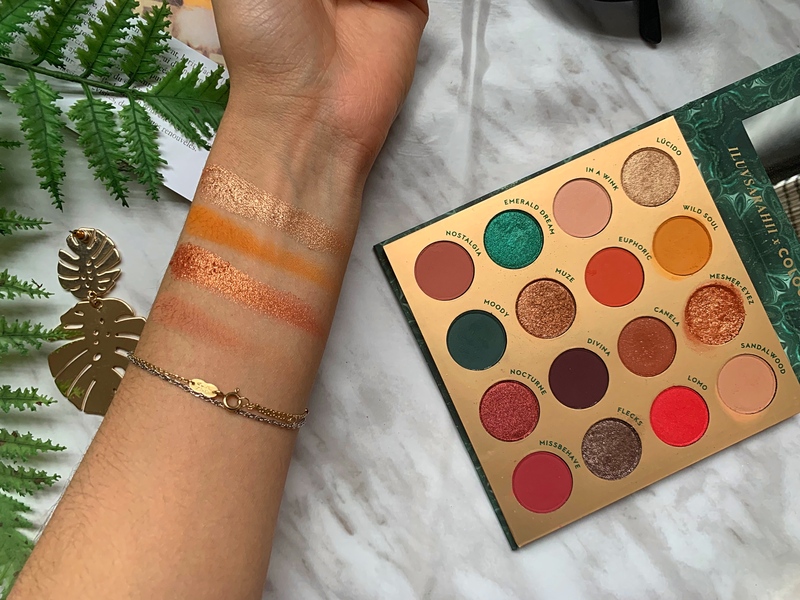 You can get this palette from colourpop but it’s currently out of stock, I have no idea if they are gonna bring it back, I hope they will cause it’s an awesome palette! 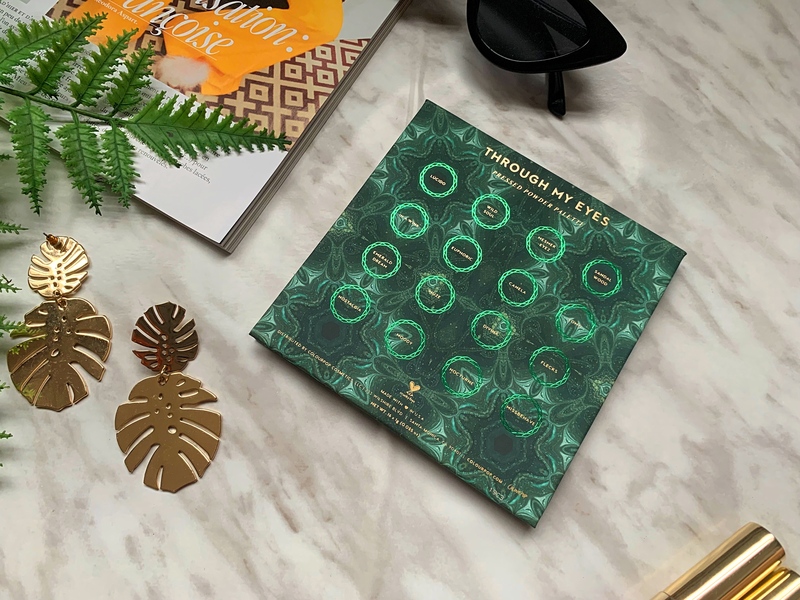 The packaging of this palette is absolutely gorgeous: I love the weird green pattern and geometric symbol, I love the feel of it, it feels very luxurious and I love how detailed the packaging is [to the touch and eye]. You have the shade’s names in the back but on top of each eyeshadow as well. 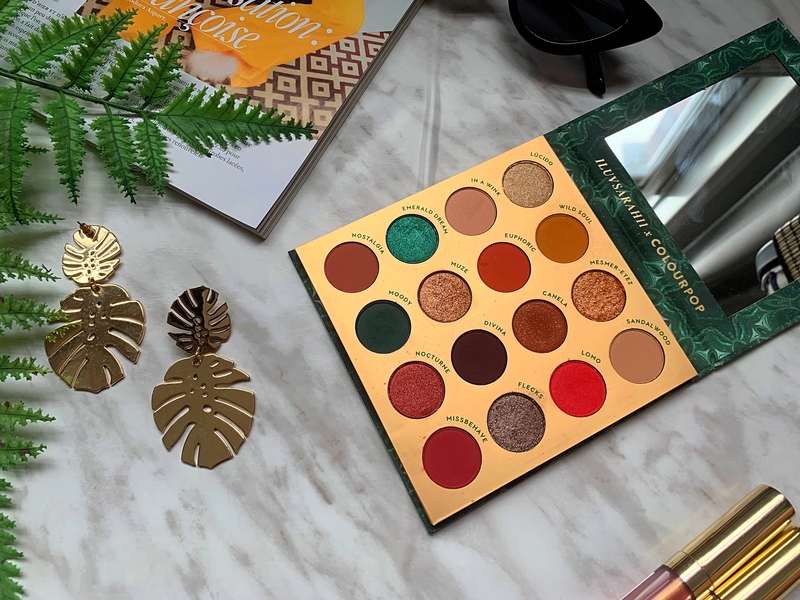 Now, when you open the eyeshadow palette, which actually has a magnetic opening, you have a decent sized mirror, the inside has the same green patterns and is gold, which again, I think looks very luxurious. The packaging in my opinion is a major reason why I got it, I mean it is gorgeous and practical, very travel-friendly, it’s not big at all and it’s not tiny, the size is just perfect. 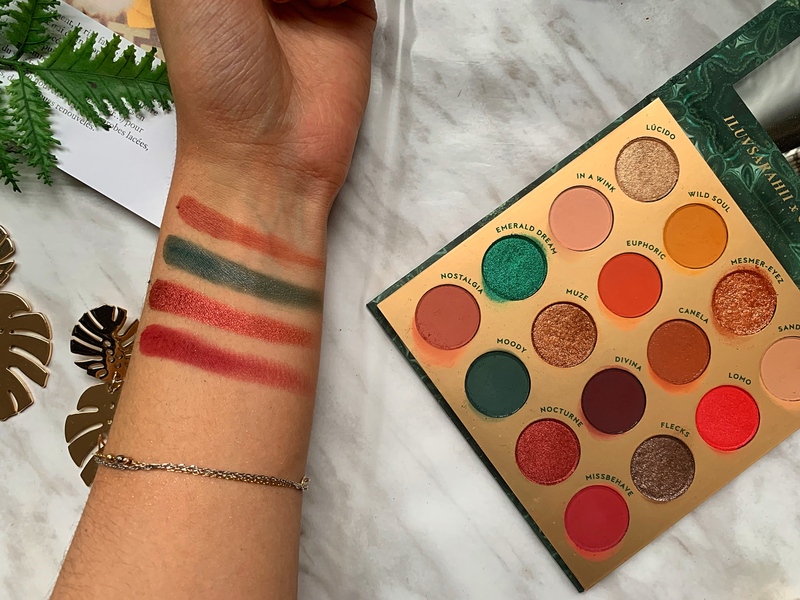 Now, on to the shade selection: I love the shade selection, they are so tropical and screams summer, I also love how versatile this palette is like seriously, you can create so many looks with it, I especially love the green shades. I do intend to share with you a 3 makeup looks, one palette post so stay tuned for that! For 23$, I think you get a pretty good formula, the shades have a good pay-off, the pigmentation is there, they are not buttery in the contrary, they are very powdery but they blend nicely in general, I think “Moody“, “divina” and “Lomo” are a bit patchy but they still perform nicely. I don’t think these are the most fantastic eyeshadows in the market but again, for 23$, I think they are great. Also, you have to take care of the fall-outs because I did get a bit on my face when I created a purple smokey eye but nothing too major. 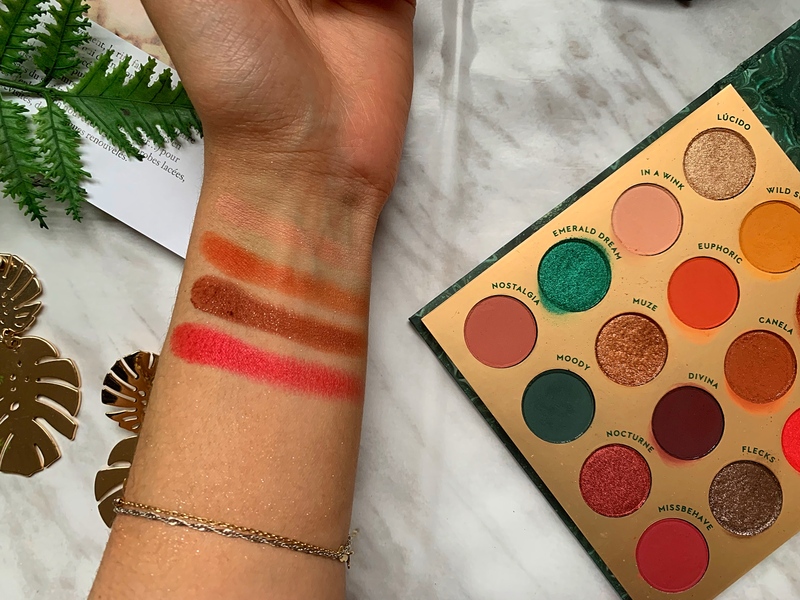 To conclude, if you are looking for really summery, tropical, versatile palette then I definitely recommend this one, it’s not too expensive and you get a pretty full palette [mirror, lots of eyeshadows]. This is definitely the kind of palette I would bring with me when I travel. And I can’t understand why this palette didn’t receive much attention, it’s so great! hahahah yes I feel you! My order was stopped at custom house and I had to pay to get it, I wish they had a shipment house here in Europe! I’d order all the time hahah I remember you had that whole order fiasco a while back! 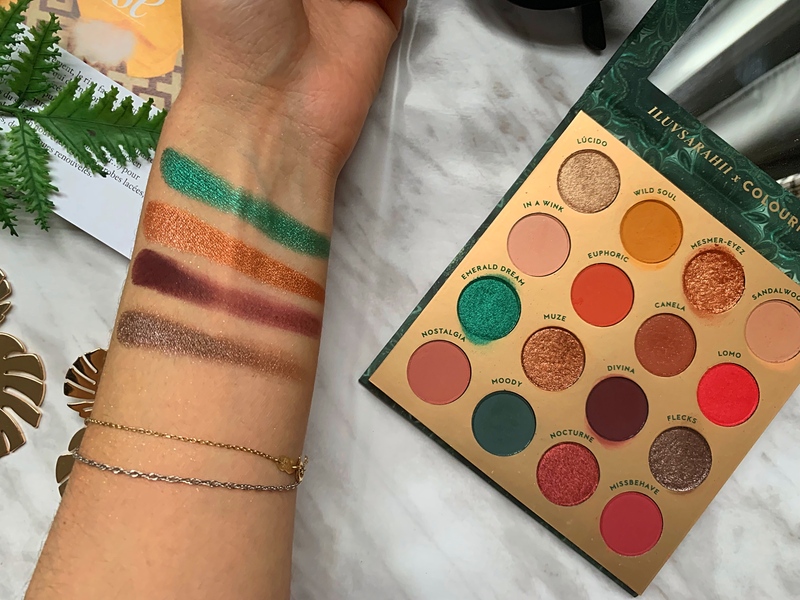 This does feel like a super summery tropical palette and those colors are beautiful and rich. Beautiful palette, loving the tropical vibes! This is such a diverse palette I love it! Honestly, the outside packaging is so beautiful I would buy it based on that alone! Love!